I trust most readers here would patiently attempt to point out to intellectual snobs who look down with scorn and mockery on those less well educated that their privileged status obligates them to act with responsibility and do what they can to broaden a community’s education. Wikipedia’s editors are, of course, the general public. The scholar who went on to call them dullards and add labels to his post that included disdain, scorn, stupidity, could have deigned to dirty his hands and correct the article himself. That’s how Wikipedia works. Anyone who sees a mistake can correct it. Some scholars would seem to prefer to sit back and laugh at lesser mortals than actually go to the trouble of sharing their knowledge and better informing them. Research that was published in Nature in 2005 showed that it is comparable in accuracy and thoroughness with Encyclopedia Britannica. There were round about the same number of mistakes in each. Wikipedia responded by correcting its mistakes. EB, on the other hand, responded with a furious rebuttal and even threatened to sue Nature or the authors of the research. But Nature published a pretty strong rebuttal. I notice that the wikipedia entry has since corrected the photo in the article that made the scholar feel so so superior to the less well informed. I should add that Wikipedia is far from perfect. There are indeed a few articles that seem to have been taken over by dedicated persons determined to undo any editing that does not agree with their own biases. I understand that there are ways to respond to those sorts of situations, but then one has to decide on priorities and time against the an every painful awareness of the shortness of life. Posted on 2018-08-17 09:59:28 GMT+0000 by Neil Godfrey. This entry was posted in Uncategorized and tagged Biblical Scholarship, Public intellectuals. Bookmark the permalink. Yes, he takes some getting used to. The best thing that can be said is that he’s actually gentler and more forgiving than Martin Luther, which is an incredibly low bar. Per vridar.org, Neil Godfrey’s work is licensed under the Creative Commons Attribution 4.0 International License. and give the required attribution info. Cf. Can I add something to Wikipedia that I got from somewhere else? Not just in theory but in reality. That’s the point of creative commons: to facilitate the spread of knowledge and intellectual creations without burying the creator in the process. 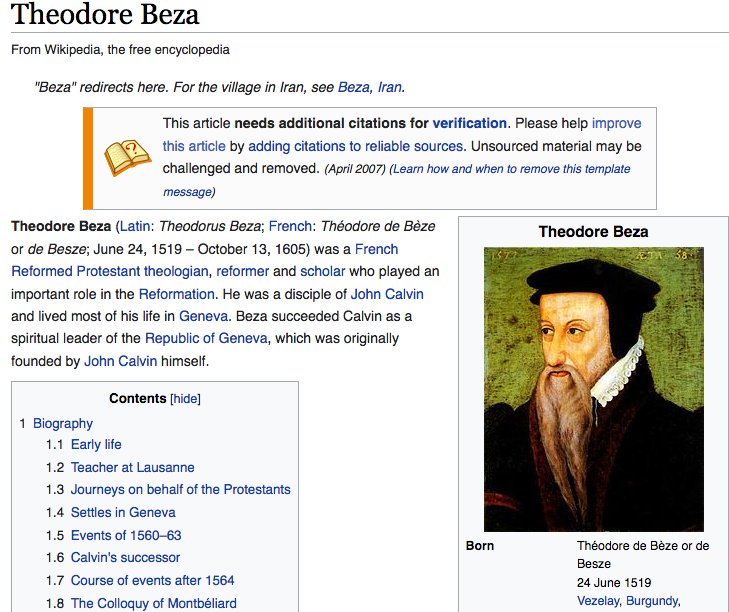 I’m probably repeating myself, but what I find most amusing here is the fact that the transparent and free exchange of information in the open forum of Wikipedia seems to work pretty well, while the opaque and byzantine methods of scholarly peer review routinely fail in spectacular fashion. • “Portrait of the Reformer Philipp Melanchthon – Lucas Cranach d. Ä.” Google Cultural Institute. • “Théodore De Beza – British School“. Google Cultural Institute. I have noticed this for a long time now. Many of those with University Degrees are completely brainwashed and cannot think outside the box they have been enclosed in. They have a form of cognitive dissonance which like those of strong religious persuasion cannot escape from, or at least that was what I thought until I read Norman Doidge M.D’s book “The Brain that Changes Itself”. I was trying to understand how it is possible not to even look at other people’s beliefs and ideas and this book does have some answers. All to do with the Brain’ plasticity and it can be changed. Jefferson subscribed to the political ideals expounded by John Locke, Francis Bacon, and Isaac Newton, whom he considered the three greatest men who ever lived. One particular editor went on an all out offensive to block adding Voltaire as an influential source. I cited several reliable sources, but he demanded a citation of peer reviewed work by a historical scholar. He was also influenced by the writings of Gibbon, Hume, Robertson, Bolingbroke, Montesquieu, and Voltaire. ‣ Embedded image per Jim (16 August 2018). “Wikipedia’s Editors Are Imbeciles”. Zwinglius Redivivus. The embedded image from above is not a screen-shot of a Wikipedia article, but rather a Google Search page. 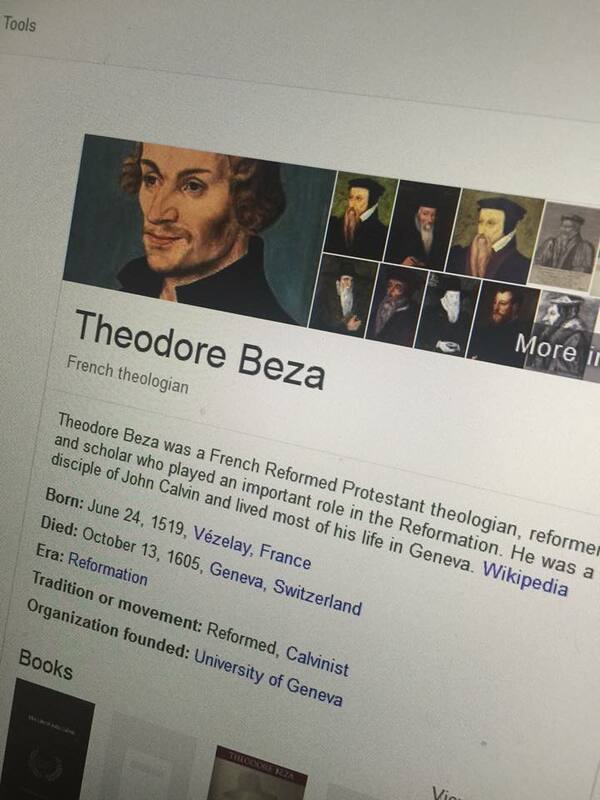 • “Theodore Beza French Theologian – Google Search“. http://www.google.com. Retrieved 18 August 2018. YouTube. Discerning History. 1 February 2016. My god I think you are right! And I trusted a biblical scholar to be honest about what he was fed on the internet! · The current photo has been extant since 19 September 2011. Lit. : BILLERBECK III, 454–56. — H. SCHLIER, TDNT III, 215–17. — SPICQ, Notes I, 384–86. 1. In Greek usage ἰδιώτης means both “private person” in contrast to public officials, and “stranger” in contrast to members of the group or local persons. Although the word does not appear in the LXX, it was taken over as a loanword with the same meaning in the rabbinic literature: heḏeyôṭ can thus designate a human being in contrast to the deity. The meaning is determined concretely by its context or by the contrast that is made. In the NT the Greek word appears 5 times, of which 3 are in 1 Corinthians 14 (vv. 16, 23, and 24). 2. In Acts 4:13 the apostles are called ἄνθρωποι ἀγράμματοι καὶ ἰδιῶται (Hippolytus Philos. ix.11.1 uses the same phrase): they are uneducated and are not scribes. Similarly, Paul calls himself ἰδιώτης τῷ λόγῳ in 2 Cor 11:6. His intent is not to describe himself as generally uneducated, but rather to emphasize οὐ τῇ γνώσει. Thus the phrase is to be translated “unversed in speaking” (cf. Hippolytus Philos. viii.18: ἰδιῶται τὴν γνῶσιν; similarly Justin Apol. i.39.3; in 60.11 parallel to βάρβαροι). In 1 Corinthians 14 Paul uses the term in reference to untranslated glossolalia. It is disputed whether Paul is concerned about the church member who is incapable of glossolalia or the non-Christian outsider. In v. 16 ὁ ἀναπληρῶν τὸν τόπον τοῦ ἰδιώτου might refer to a church member whose status (cf. τόπον in Acts 1:25) leaves him ignorant of glossolalia. The meaning in 14:23 is also ambiguous: “When the whole church assembles and all speak in tongues, εἰσέλθωσιν δὲ ἰδιῶται ἢ ἄπιστοι, will they not say that you are mad? But if all prophesy, εἰσέλθῃ δέ τις ἄπιστος ἢ ἰδιώτης, he is convicted by all.” Schlier (217) and Conzelmann (1 Cor [Hermeneia] 243) see no distinction between ἄπιστος and ἰδιώτης, while BAGD (s.v. 2), referring to the t.t. of religious associations, understands ἰδιώτης as a type of proselyte, a participant who is not fully a member. The parallel to βάρβαρος in Justin [see above] is also present in 1 Cor 14:11. Sparkes, A. W. (1988). “Idiots, Ancient and Modern”. Politics. 23 (1): 101–102. doi:10.1080/00323268808402051. In general, it is evident that the term . . . takes on its concrete sense from the context or the specific contrast. There can be no fixed rendering, though it always maintains the basic sense of one who represents his own interests as compared with the official or public interest. Even the professional or the expert is broadly concerned with the public interest at large. Schlier is too wistful for unity. There is no reason for thinking (or for thinking that the Greeks thought) that there ts a conceptual link between being foreign or unskilled and representing one‘s own as compared with the official or public interest and Schlier‘s final sentence is a piece desperation to which I reply with Wittgenstein’s challenge: Don’t say: ‘There must be something common . . . but look and see whether there is anything common at all’ (Philosophical Investigations Pt I para. 66).